Thanksgiving trivia can serve a variety of purposes. It can give kids a history and context for our traditions, or it’s just a way to keep your weird relatives from talking about gory medical procedures, starting a nasty fight about politics or discussing slights that occurred decades ago that are sure to make the blood of other relatives boil. Useless information is safe, my friends. It can also be interesting and fun. The first Thanksgiving lasted a full three days. That’s how long the Pilgrims feasted with Massasoit and 90 other members of the Wampanoag tribe. Which American President was the first to declare a day of Thanksgiving? George Washington. He issued a proclamation naming Thursday, November 26, 1789 as a “Day of Publick Thanksgivin,” according to the National Archives. A celebration on a specific day every year didn’t occur until President Lincoln declared Thanksgiving a national holiday in 1863. Congress did not make Thanksgiving a national holiday until 1941. While “gobble” is the call most people associate with turkeys, the birds have at least 28 different known vocalizations. Other calls, including “yelps,” “clucks,” “putts,” “cackles,” “purrs,” “hoots” and “hisses,” are used to indicate danger, advertise the caller’s gender, establish control and keep the flock together. How Did The Pilgrims Make Their Green Bean Casserole? They didn’t. Green been casserole came into being just 50 some years ago and was created by Campbell’s soup. It came about when the company was making new recipes for its annual cookbook. When was the first Macy’s Thanksgiving Day Parade held? Of The Three Utensils We Use To Eat (Fork, Spoon & Knife) Which Was Not Present At The First Thanksgiving Feast? The fork. The fork was not brought by the pilgrims. What did they use to eat their meal with? Spoons, knives and their fingers. Have Turkey, Stuffing And Football Always Gone Hand In Hand? Not quite. It all started in 1934, when the Detroit Lions was bought by G.A. Richards. Trying to build up the fan base for the team, he scheduled a game for Thanksgiving Day to play the Chicago Bears, who at the time were world champions. The game sold out and was broadcasted live on radio. And with this huge success a tradition began! Since then, the Detroit Lions have played 67 Thanksgiving games! What does a President traditionally do for a turkey? He pardons it. The National Turkey Federation has given a turkey to the White House every Thanksgiving since 1947. Until 1989—when George H. Bush began the tradition of pardoning the White House turkey—nearly every president chose to eat the bird. Spared turkeys spend the rest of their days in the happiest place on earth: Disneyland. How many feathers does the average turkey have? Between 3,000 and 3,500. While commercially raised turkeys usually can’t fly—breeding practices have altered their body proportions—the wild variety can hit speeds of up to 55 miles per hour when spooked by a predator. They can also run up to 20 miles an hour, making them a tough target for hunters. • Great Location – In the TRUE HEART OF DUNWOODY! Walk to local restaurants, grocery stores, shopping, the office, Marta & more! Minutes to Perimeter Mall, I-285 & GA400! • First Floor Unit – Above garage; convenience of ground floor with safety & view of higher unit! • Big Bedrooms -Two spacious bedrooms w/2” blinds ceiling fans & large walk-in closets! Both have French doors leading to the balcony! • Beautiful Bathroom – Elegant bath with tile floor & tile shower/garden tub and double vanities! • Kitchen – Cherry cabinets, Corian counters, tile backsplash & floor, stainless under mount sink, crown molding, walk in pantry & breakfast bar! Open to Dining & Great Rooms! • Great Room – Crown molding, ceiling fan, 2″ blinds & French door leading to balcony! • Dining Room – Off kitchen w/crown molding, wainscoting adds a chic touch! • Secure Community – Gated property access, secure building & elevator entry/access. • Amazing Amenities – Clubhouse, salt water Pool, fitness center, fire/sprinkler system, elevators, prof. landscaping & drive under garage parking! Impeccably maintained property! Financially solid HOA with plenty of reserves. 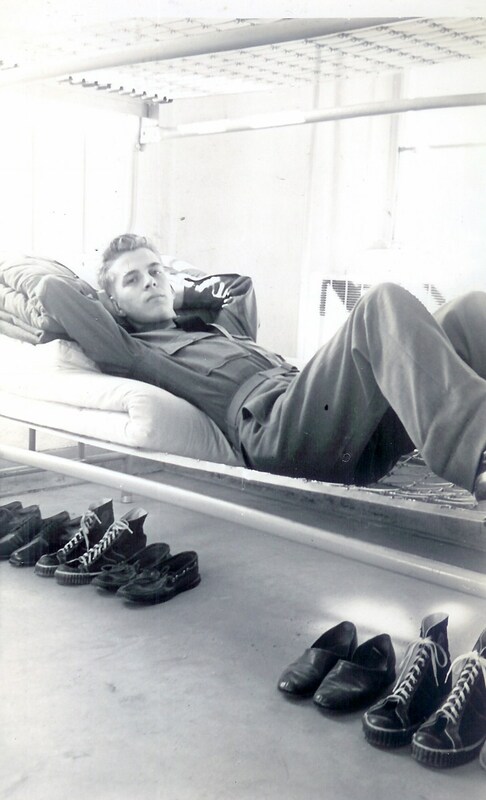 my Dad getting settled in for training at Maxwell AFB in 1942.